The population is aging. Forbes estimates 10,000 people are becoming eligible for Medicare daily, and this trend is expected to continue for another 15 years. The percentage of people choosing private Medicare Advantage (MA) over fee-for-service Medicare (FFS) has also continued to grow every year. And pending member cost sharing changes for Medicare Supplemental Parts C and F in 2020 may drive even more people into Medicare Advantage. … but winning the business isn’t so simple as the Medicare marketplace changes. I can remember a time not too long ago when you could meet your goals by simply mailing prospects information during AEP. A decent portion of those mailed would respond, and with a seasoned salesforce you would close a high percentage of these leads. If you had a successful AEP, you made your year. Well, that’s no longer the case. 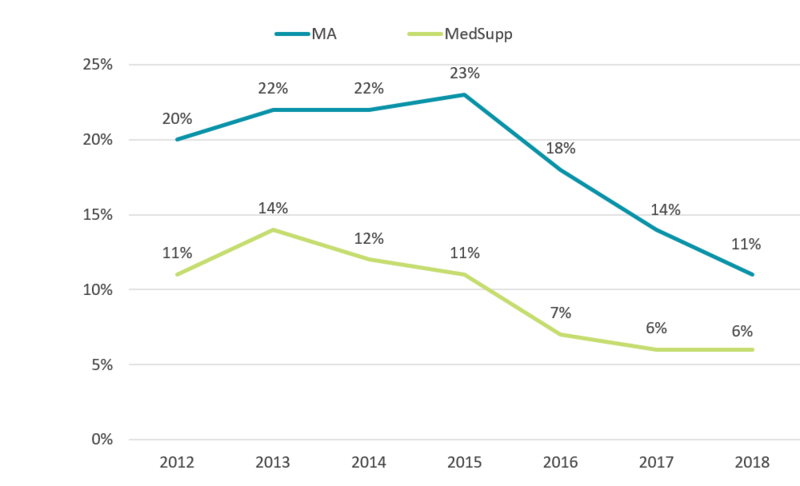 The Medicare Advantage marketplace has become fairly stable. Benefits have had minimal changes, reimbursement to carriers has been better than expected, and the service area reductions of 2012-2014 have run their course. To put this into perspective, according to Deft’s 2017 Medicare Shopping and Switching Study, Medicare Advantage switch rates have dropped for the last three years: From 23% in 2015 to 14% in 2017. Taking a sneak peek at the 2018 Medicare Shopping and Switching Study, the Medicare Advantage switch rate has dropped to 11%. That’s half the switch rate compared to 2014, just four years ago. You need to really consider increasing your commitment to other enrollment sources. With Boomers reaching retirement at 10,000 per day, they are making a big impression on the Medicare market and should be in your sights. By nature, they are hard-working, although many didn’t prepare adequately for retirement, both factors that push a good number to work past 65. Although they didn’t grow up with technology they have adapted and are extremely computer savvy. Their self-assuredness, opinionated disposition, and high expectations demand innovation, real time answers, and unique benefits. Strongly consider redoubling your efforts to capture Age-Ins as they can offset the shortfall now occurring in AEP. Seniors don’t use computers, right? Wrong! Baby Boomers now spend more time online than millennials with 51% of Seniors aged 51-69 and 41% of Millennials aged 18-33 spending 15 hours a week online. 58% of those ages 65+ seek healthcare information online and 43% search for healthcare information on Facebook. Online retail sites have set the bar high for online experiences. If you’re not investing heavily in your website, online content and marketing, social media, and supporting technology you’d better start! Budgets are diluted when you increase spending on digital marketing and place a greater emphasis on Age-Ins. It is difficult to justify significant budget increases for these new commitments because they are necessary for making up for lost reach and membership. What is the cost per response and cost per acquisition? How well can I target or personalize the message? How closely can I measure the activity? Is it a short-term or long-term investment? And, how closely can I measure the activity? You probably noticed I mentioned “measure” twice. If you can’t measure a program or campaign performance, it should be a low priority. Data analysis and predictive models get more accurate over time as they are tested, measured, and refined. If you haven’t started using available data to help inform your decisions, you should. Targeting Age-Ins is a good example. According to Deft’s 2017 Age-In Study, only 49% of those aging in to Medicare actually plan to retire by 65. Another 26% plan to retire by age 66 or 67. If instead of focusing only on 64 year olds, you decided to add 65 and 66 year olds to your target, you would triple the cost for a comparatively small opportunity. Instead you can use data and predictive models to weed out who is going to choose FFS over MA or the 51% of people who don’t plan to retire at 65, and to figure out who is going to retire at 66 or 67. Start building models but be careful not to overcommit until you are confident of their results. Depending on the industry, it costs 5 times more to acquire a new customer than retain an existing one. This certainly holds true in Medicare given the high retention rates, limited sales window, and the acquisition cost. And don’t forget, we’re talking health insurance with risk revenue --it can take up to 23 months to get a new member’s risk score to the appropriate level. Always make customer experience a priority.